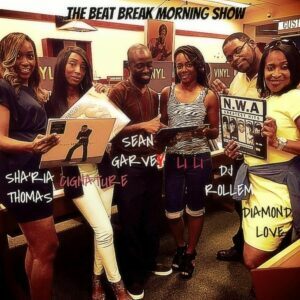 The Beat Break Morning Show with Sean Garvey, DJ Rollem, and The Wake Up Ladies is a variety mix radio show intended for audience members between the ages of 18 to 45. The program is designed to educate, uplift, inspire and entertain listeners through various talk and music segments. The syndicated radio program provides audiences with in depth celebrity interviews, on-air conversations, current events, entertainment news, independent hip hop and R&B music from independent artists. Beat Break Radio accolades include several nominations from the ATL’s Hottest Entertainment Awards as hottest online radio show between 2013 through 2017 and the Georgia State bill HR681 honoring men and women in radio for outstanding work in broadcasting. Hollywood stars such as Cedric the Entertainer, Taraji P. Henson, Katt Williams, Niecy Nash, Rae Sremmurd, Sevyn Streeter, Antonio Fargas and much more have appeared on The Beat Break Morning Show.